Recently I was able to reach out to former Met, Pat Mahomes, who was nice enough to answer some questions for us Mets Junkies that just can’t seem to get enough. Before we get into the interview with Mr. Mahomes, let’s take a look at his career before getting to New York. Mahomes was drafted by the Minnesota Twins in the 6th round of the 1988 draft. He made his MLB debut on April 12th in 1992 against a heavy hitting Texas Rangers club going 6 innings in a no decision. After a few rough years in Minnesota & even 1 in Boston, Mahomes opted to play in Japan during the 1997 & 1998 seasons. He suited up for the Yokohama BayStars during his time in Japan. In 99, he was able to strike a deal with the Mets where he eventually ended the season with an 8-0 record, helping the Mets advance into the Playoffs via the Wild Card. For me personally, I was a big fan of Mahomes. He always seemed to come into the game when the Mets were pressed on pitching & he delivered while pitching over his 2 years with the Mets. He always seemed to have the demeanor that the team came first & he was ready to take the ball whenever the Mets needed him to. MetsJunkies: Firstly I’d like to thank you for taking the time to speak with us Mets Junkies that can never get enough. As well as Congratulations with Patrick Mahomes II unbelievable college success & we definitely wish him the best in his career. 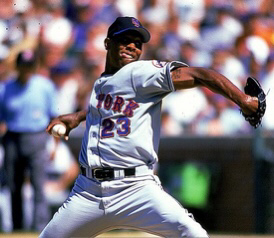 MetsJunkies: How did you go from pitching in Japan in 1998 to receiving a contract from the Mets before the 99 season? MetsJunkies: What was it like when you came back from Japan? Was there a lot pressure on you or did you feel you’ve already ran the gauntlet? MetsJunkies: Late in 1999, you ended off the season going 8-0 helping the Mets to play offs, how did it feel to be such a big contribution & part of the pen down the stretch run? MetsJunkies: Who was your favorite player to room with while traveling & why? MetsJunkies: Was there a prankster of the team? MetsJunkies: Can you give us a scouting report of yourself in hindsight? MetsJunkies: Do you have a favorite moment as a Met? MetsJunkies: Congratulations with young Patrick II’s success, I’m not very much into college football but I happened to flip a game on just in time to watch him sling something like a 65 yard pass. His athleticism probably doesn’t surprise you but is there an aspect to his game that surprised you & caught you off guard, in a good way of course. On behalf of the Mets Junkies website, Mr. Mahomes it’s an honor to just be able to speak with. I honestly enjoyed watching you in Mets Orange & Blue, sir. Thank you for taking time away from your schedule to answer questions for us Mets Junkies. Previous Is Conforto ready to bounce back along side the Mets?